Reality: Your kids will be fine. In fact, the example you set by going back to work may leave them better off. Reality: Don’t sell yourself short. You have unique skills and experiences that every company needs. What you don’t have, you can learn. Reality: Millions of women have made the comeback. You can, too. Karyn never intended to work full time again after leaving to raise her two children. But seven years later, when a divorce seemed imminent, she went job-hunting — only to find that getting back was as daunting as climbing Mt. Everest. With no resume, no current contacts, and no transferable skills for the jobs she was applying to, Karyn didn’t even know where to start. 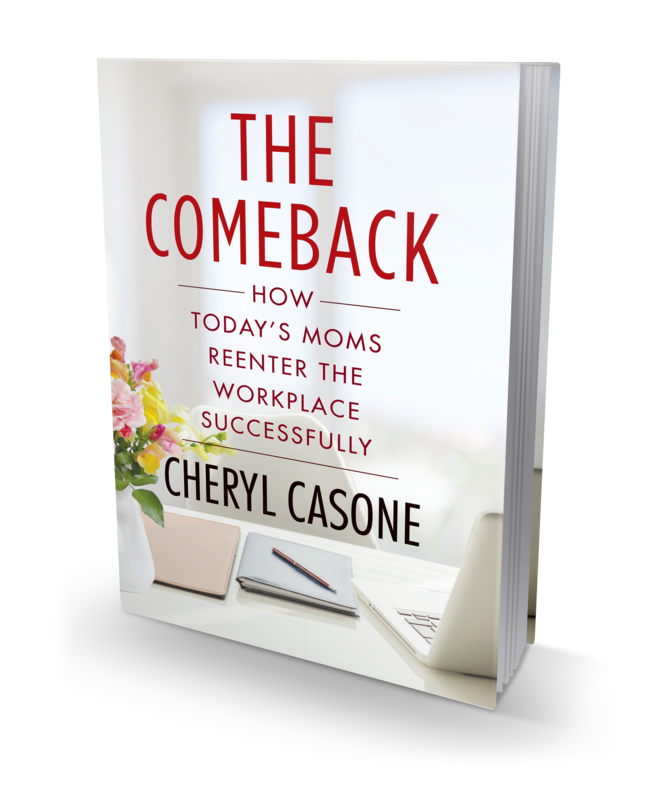 Fortunately, career expert and Fox Business anchor Cheryl Casone has written a comprehensive guide to making the comeback. After interviewing hundreds of women who are willing to share both their successes and their mistakes, Casone offers a one-stop shop for moms at every stage of the process. This is the perfect book if you’re…. Pregnant and wondering how to take an extended maternity leave without losing your contacts and momentum. Trying to stay connected and relevant in your field while you’re away. Thinking about what to say in interviews about the gaps in your resume. Looking for creative alternatives if your former career just isn’t possible anymore. Struggling with prejudice against working moms. The many real-life stories in this book (including Karyn’s) prove that with a smart strategy and some determination, almost any mom can make a successful comeback. In the process she can improve her standard of living, her self-esteem, and probably also the well-being of her kids.